9 inch flip down TFT LCD Monitor PAL/NTSC Video system Full function remote control Type:TFT-LCD Display format:16:9 Power supply:DC12V-32V System:NTSC/PAL Operation temperature:-0.5℃≈ 60℃ Video inputs composit video signal Power:≤9W Color:Beige Package included: 1x Color monitor 1x Contorller 1x Use manual. Supports the latest Mirror Link via WiFi and via Android or WiFi Android smartphone. - Built-in WiFi modem, support 802.11b / g / n WLAN standard, high performance, low power consumption. - support A2DP Bluetooth, you can play through the phone through Bluetooth stereo music. 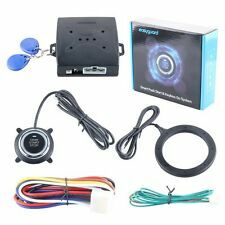 Smart RFID Car Engine Alarm Finger Push Starter. This is a simple and easy use RFID Car Alarm with Finger Engine Start. RFID Car Engine. - RFID engine lock. Button (1m Cable Length), 1 x RFID Sensor Ring (1.2m Cable Length), 2 x. 32sqft 118"x39" Sound Deadener Car Heat Shield Insulation Deadening Material Mat. Can make the heat of the engine evenly distributed to avoid overheating the lid. Effectively blocks 97% of radiant heat transfer. Audio Format MP3、 WMA 、 AAC 、 RM 、 LFAC…All Format WIFI Built-in WIFI module. Vldeo Format MPEG-1/2/4、 H264 、 H263 、 VC1 、 RV 、 RMVB 、 DivX 、 VP8 、 AVS Stream…Al Foramt 4G With an external USB type 4G dongle, just put your 4G SIM card in it, you can access the internet in more places. 5983 Car Audio is equipped with AUX radio presets for all of your favorite stations. - Front USB and AUX input. - Support USB / SD / MMC card reader, up to 32G. - SD card front loading slots. - Built-in high sensitive FM tuner. Maximum Power: 150W. Strong performance in the low treble. Sound Film: PEI. 3 way, refers to the treble, bass, alto. High-density magnet, strong voice performance, the use of aerospace magnets, power full. Digital high-quality FM stereo radio. Built-in Bluetooth phone. PC interface type:ISO. 1 x car MP3 player. Support Audio: MP3 / WMA / WAV, etc. Support USB / SD / MMC card reader. 1DIN Car Bluetooth Hands-free Call Stereo Audio MP3 Player With SD/MMC Card Slot. 1 Piece Fuse Relay Holder With Case (Not included the fuse and relay). Type:Fuse Relay Box. We have warehouses in the USA, CA, and AU. Installation Site: Headrest. Support TF card and USB (Max 32G). 1 x Car cigarette lighter. We are sorry that the item is defective, and we will actively deal with such incidents. Our office hours are . TV system: PAL / NTSC optional. One Set Motorcycles Changing Wheel Tire Tyre Rim Edge Protection Tools For KYMCO. Portable One Set Black Car SUV Seasonal 13"-19" Tire Storage Bags Protector Tool. Black Vehicle Interior 3D Imitation Leather Texture Dashboard Film Vinyl Sticker. Built-in Bluetooth function. Digital FM stereo radio. FM Frequency Range: 87.5-108.0MHZ. EQ function(Only for MP3 Playback). Red LED Screen. CAR MP3/BLUETOOTH/FM PLAYER. FM Channel: 87.5 - 108.0MHz. Type: Car MP3 Player. Universal 98.43"×39.37"/250cm×100cm 7mm Useful Firewall Sound Deadener Car Heat Shield Insulation Deadening Material Mat Aluminum Foil. 1 Pcs Sound Deadener. Material: Aluminum foil. Can make the heat of the engine evenly distributed to avoid overheating the lid. High-quality digital stereo FM radio. Built-in Bluetooth Microphone. This is car radio MP3 player support the USB TF card. (Radio frequency: 87.5-108MHz). 1 Car MP3 player. There is not CD room for the CD Player. Features and specifications: Key features: ? Hands-free phone calling ? Noise and wind suppressed by CVC technology to create full duplex sound quality ? Cell phone can be connected automatically when the device turns on ? Supports external TF card or USB flash disk, can play music files in MP3/WMA format Specifications: ? Working voltage: 12 – 24 V ? Output current: 3.1A (dual USB port) ? Output voltage: DC 5 V ? FM frequency: 87.5 – 108 MHz ? Bluetooth range: 10 meters ? Support TF card/U disk: 512 MB – 32 GB How to use: 1) Plug this device into a car cigaretter lighter port. 2) Select any frequency with an empty station. 3) Turn on the car FM stereo and match the frequency to that of the device. Package：one piece. 3.5mm AUX Extension Cable Lead Mounting Panel Car Boat Dash Flush Mount USB Port. 1 x AUX Flush Mount USB Headphone Jack Cable. 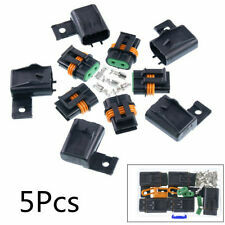 - Allow mounting of socket on you car's dashboard. Cable Length:150cm. -Suitable for most of the car. Installation Site: Headrest. Car Dual Hole Spark Plug Tester Detector Ignition Plug Analyzer Diagnostic Tool. Car Front Bumper Splitters Carbon Fiber Printing Decoration Strip Anti-Scratch. 2 Pcs Car Carbon Fiber Printing Bumper Splitters Corner Anti-Scratch Protector. 1 Pcs Sound Deadener. Can make the heat of the engine evenly distributed to avoid overheating the lid. Effectively blocks 97% of radiant heat transfer. Reduces unwanted sound and most vibrations. Power: 100W、 300 DB. The sound is pure, super loud ! Horn Mouth Size: 15.4cm. Horn Length: 16.6cm. Can be mounted on any application that has a 12V power available. PA microphone assembly for clear voice commands, the tones can be heard clearly even a mile away. Maximum Power: 100W. - PP injection basin, natural rubber diaphragm, full flexibility, can perform well all kinds of music. - High-density magnet, strong voice performance, the use of aerospace magnets, power full. Support 4G LTE:Just insert a 4G card to surf the internet. - WiFi: Built-in WiFi Modem, support 802.11b/g/n. - Operation System: Google Android 7.1.1. - Built-in DAB Player App: Yes. - DAB Box In: One. Built-in 3G and WiFi enables you stay connected on the go and fast web browsing. You can connect through WiFi or a hotspot of your smartphone/device. And Visualize on a map your car's location, driving path and speed. Support U disk and SD/MMC card playback, support three formats decoding (MP3/WAV). Bluetooth is based on the CLASS 2 power class, uses the Bluetooth 2.1 EDR specification, is compatible with Bluetooth 3.0 and below, and has a transmission speed of up to 3 Mbit/s. 1 x MP5 Player. Build-in Bluetooth V2.0 hands-free call. Built-in radio FM tuner, automatic search function. Radio chip: QN8035. 1 x Car Speaker Cable Kit. 12V Auto Car Heater Heating Fan Car Vehicle Portable Heater Heating Cooling Fan Car Dryer Windshield Defroster Demister. 12V Car Vehicle Portable Heater Heating Cooling Fan Defroster Demister. Automatic heating, overheating protection. 1 x Car MP5 Player. Breathable Black White PU Leather 38cm/15" Car SUV Steering Wheel Cover Nonslip. Bluetooth can work with most devices, connect the phone to keep your hands free when a call is coming. The MOST Diagnostic Kit to help you to quickly find the fault point, whether it is the problem of the motherboard transceiver, or cable connection problems. Stable characteristics, high reliability. 1x Female Connector. Built-in Radio, FM / AM / RDS. 1 x Car MP5. Multi-format audio and video decoding, support 1080P full-format. Built-in Bluetooth, phonebook / Record download and BT music;. FM range:87.5~108.0MHz(EU). Color： Beige. The Straight Key`s Length is More Than 9CM is not suitable. We will reply you within 24- 48 hours. This ceramic heater and fan provides instant heat even in the coldest conditions. Provides instant heat even in the coldest conditions. Note: Light shooting and different displays may cause the color of the item in the picture a little different from the real thing. Feature: The MOST system uses optical fibers as an information transmission medium for digital signal transmission. First, each control component converts the electromagnetic pulse signal into an optical pulse signal and transmit it to the optical fiber, and then the corresponding receiving computer converts the optical pulse signal Back to the electromagnetic pulse signal, such a total of the corresponding control function. Size: total length 30cm Shape: tee (two males adapter one female adapter) The package includes: 1PC. Folding Remotes Quick Remover/Installation Tool Key Fixing Tool Flip Key Vice Of Flip-Key Pin Remover. easy to take out the pin from flip key. This tools is used to separate the old key blade and put in the new key. The Straight Key`s Length is More Than 9CM is not suitable. Color： Brown. Support USB / SD / MMC card reader. Built-in Bluetooth V4.0 microphone. Digital high-quality FM stereo radio. Supports Advanced Audio Distribution Profile. Support Audio: MP3 / WMA / WAV, etc. L / R RCA audio output jacks. 1 x Siren Box Unit. 8 Tone Hands-Free Operation with override from the horn ring. connected with the horn. The white and yellow can be connected to each other by 2 flashing lights. This ultra-thin computer speaker is the latest launch of the new products. 1 x MP5 Player. Build-in Bluetooth V2.0 hands-free call. 7" TFT Touch Screen 2DIN Bluetooth AM/FM Car Dash Audio Radio Stereo MP5 Player. Built-in radio FM tuner, automatic search function. Radio chip: QN8035. Block Sound Deadener Material Heat Shield Insulation Pad Thermal Proof Mats 1/4''(6mm) Features: Flexible, crush resistant, non-toxic & fragrance free (Will not smell), creates a mold and mildew resistant vapor barrier. Reduces unwanted sound and most vibrations. Keeps your interior cooler in the summer and warmer in the winter. Can make the heat of the engine evenly distributed to avoid overheating the lid. Effectively blocks 97% of radiant heat transfer. (12V Portable Autos Center Console Cooler Cooling Fan Evaporative Air Conditioner. ● Android device use; After connecting to the WIFI of F-Car SSID, the APP video will pop up automatically. Subnet mask). 1pcs PU Carbon Fiber Black Car Key Holder Keychain Keyring Keyfob Case Cover. Material: pu carbon fiber. New car new carbon fiber blue key bag. 1 x Leather Car Key Case (not include car key). We will try our best to make you satisfy. Universal Black 50X100cm20mm Acoustic Foam Car SUV Deadening Sound Shield Cotton. The fuse will automatically blow current when the current rises abnormally and reaches a certain height. Thereby functioning to protect the circuit and operate safely.